November, Movember – raising Men’s Health Awareness one mustache at a time…. 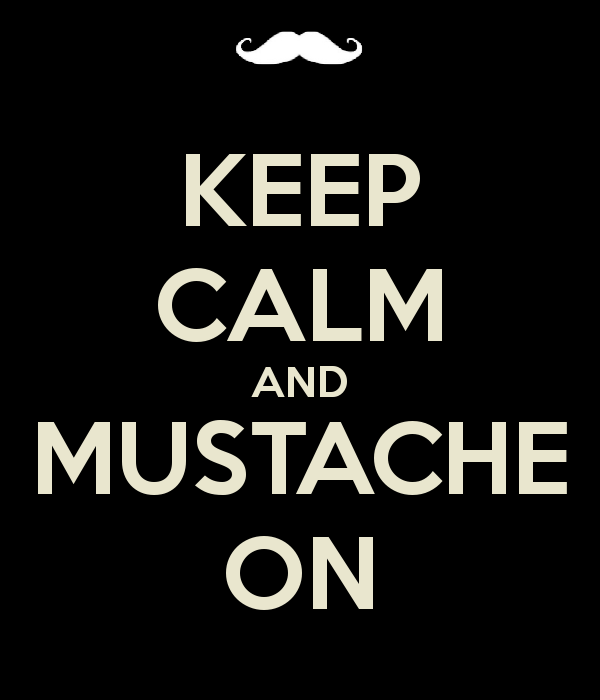 Welcome to fall, where leaves are changing colors, temperatures are dropping and mustaches are….. growing?? That’s right! November is now Movember or, “No-Shave November” as we used to call it; a whole month dedicated to, you guessed it, MUSTACHES! Well, not quite. The Movember Movement was created to bring awareness to men’s health issues including: prostate cancer, testicular cancer and mental health issues. This awesome movement is led by The Movember Foundation: a leading global organization dedicated to changing the face of men’s heath. So you want to take part? Mo Bros (men who support Movember) first register on The Movember Foundation’s page. They then start off the month of November clean-shaven, and continue to grow and maintain their mustache for the entire month of November while raising money for a great cause. Ladies, you can take part as well. Mo Sistas (women who support Movember) are encouraged to get involved by registering, creating or joining a team, raising funds and talking to the men in their lives about men’s health. In addition to growing a spectacular Connoisseur mustache, men (and women too!) in the medical field can sport the I Mustache You Sesame Street Unisex Scrub Top by Cherokee Uniforms all month long. Why is Movember so important? Bringing awareness about men’s health issues is the first step to prevention. What the Movember Movement is trying to accomplish is sparking the conversation about the these important issues men are facing today. Below are a few facts you should know. 1 in 6 men will get prostate cancer, and approximately 28,000 men will die from the disease this year. Testicular cancer is the most common cancer in young men ages 15-35. According to the CDC, heart disease and cancer are two of the leading causes of death in US. 1 in 4 adults will experience a mental health problem in a given year. More than 4 times as many men as women die by suicide in the US. In 2010 a total of 38,364 Americans died be suicide. 79% of which were men. Needless to say, there are ample reasons why The Movember Foundation is taking action towards spreading men’s health awareness, and you should too! One of the main reasons the state of men’s health is so poor, is because of the lack of awareness and understanding. In addition, research shows men are 24% less likely to visit a doctor than women. Here are a few tips to get our guys on the right path. Talk about it! – Use this information as a conversation starter with your family and friends. Ladies, talk to the important men in your lives; encourage them to talk about their health. Schedule annual exams – Getting the regular screenings you need can SAVE YOUR LIFE! This is also the perfect time to talk to your doctor and discuss more ways to lower your risk for health issues. Eat well – Incorporating a healthy diet is key to improving your well-being. You can start by making small changes to your eating habits like choosing a piece of fruit over a bag chips. Get Moving – Adding physical activity to your daily/weekly routine is paramount to strengthening muscles and bones. Physical activity helps to reduce the risk of a heart attack, stroke and certain types of cancer. It can also help to reduce symptom of depression and anxiety. Try to get at least 2 ½ hours of physical activity a week. The Centers for Disease Control and Prevention provides great ideas on how to get active on their Healthy Living Page. Stay informed ­– Knowledge is power. Knowing how to prevent and treat the men’s health issues can greatly improve the state of men’s health worldwide. The Men’s Health Network is an excellent place to keep up with the latest information about men’s health. If you visit the U.S. Department of Health’s website, you can find valuable resources to get you on the way to a healthier you. We’d love to see how you are spreading men’s health awareness. Please share our blog on your Facebook, Twitter, Pinterest pages and tag us on Instagram “#uascrubs” and “#movember”!